One of the most recognizable signs of life is growth. Growth indicates inner strength, stability, and maturity. As a parent wishes for his or her child to grow up big and strong, we as Christians should long for our churches to be growing, healthy ministries. Though this longing for growth may be fervent, growth in a church is often easier said than done. In 2011, Church of God Ministries celebrated the tremendous growth of Hoopeston First Church of God in Hoopeston, Illinois. In the past five years, 250 baptisms have taken place! As astounding as this is, Pastor Micah Mobley says they’re not done yet. 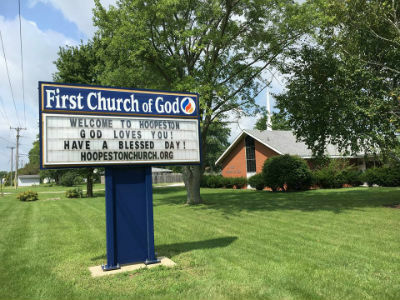 Hoopeston First Church of God first and foremost attributes all the glory to God for their vast growth. Six years ago, the church decided that the community around them was in dire need of Christ. In a town of about six thousand people, 80 percent do not attend church. Reaching the community and making services focused on reaching those 80 percent became their first priority. In order for their efforts to make a real difference, serving, being outward-focused, sacrificial giving, praying, and fasting was necessary. Failure was not an option. Like any major change, there were struggles. Most of the struggles Mobley attributed to culture. “At the end of the day, the biggest struggle is ourselves—our inherent selfishness and inability to love like we should.” He firmly believes that churches should actively see people come to Christ and not just accept the status quo. Churches must be willing to work! Baptisms are not the only big change. Souls are being saved, families are changing for the better, and marriages are being restored. The Lord has also blessed the church financially. In 2012 they had a million-dollar expansion without doing a capital campaign! New outreaches are benefiting from this expansion, as well as providing for several more staff members. Currently, the church is also in the process of opening a community youth center which will be the first of its kind in Hoopeston. Since 90 percent of youth in the community do not attend church, the congregation will love them where they are. To carry this momentum into the future, Mobley shared that there is a new campaign coming this fall called ReBoot. Hunter Tibbs, Anderson University 2016 graduate, will be assisting as the connections and outreach pastor, while the church continues to address what they can do better to reach the lost and make disciples. Pastor Mobley would certainly agree that this kind of growth in Hoopeston is not just some exciting exception—every church has the potential to grow. When built on the foundation of Christ, with the support of fellow Christians, and plenty of hard work, growth is more than possible. Our Lord is alive. Our churches should be, too. This entry was posted in All Church of God, Great Lakes and tagged baptisms, church growth, church health, Emily Ploetz, Hoopeston, Illinois, Micah Mobley, revival, salvation. Bookmark the permalink.